Despite the great wave action and beauty the Oregon Coast is not considered a prime surfing destination primarily because of the rocky shoreline and cold water and weather. 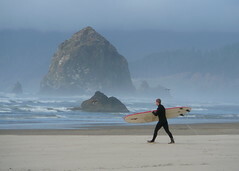 But this doesn't keep everybody away and many surfers still find a great ride in places along the Oregon Coast like Cannon Beach. Cannon Beach is along the northern Coast of Oregon and easily accessible from Portland and Eugene, the state's two largest population areas.